Well we all know sandpaper, and I think that the majority of speedsurfer use now and than a bit of sandpaper to smooth the fins for example. But what sandpaper should do the finishing job???? Or should we polish everything that is in though with water?? Polished, water cannot from a layer on the surface. Polished surface have theoretical the best waterdisplacement, thinnest layer on fins. Why don't we polish our fins??? simple answer to that: with a polished fin the surface will release from the water when air is involved, this means you will instantly loose 2/3 of the lift that the fin generates. SPIN-OUT is often followed. 600 grit sandpaper, that is what I use for my fins to finish, but I don't know if this is the best. It is easy to get and quite fine. My carbon art boards are all polished on the bottom, it is not dangerous when the bottom of the board releases from the water. And polished surfaces don't get dirty! 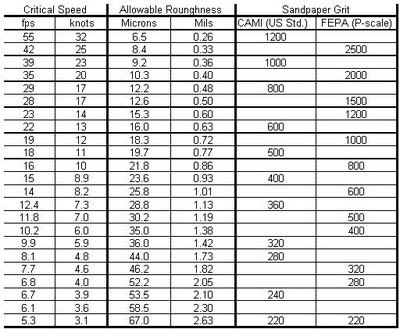 On Boogie his site I found some table with sandpaper vs waterspeed, don't know how those figures were calculated but from those num bers we speedsurfers should use 1000 or higher.